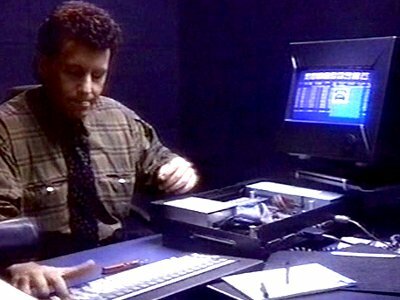 Technically, Paul Reiser is playing Tony Minot, a guy who would rather spend his time in his apartment, composing new age synthesizer anthems and eating left over pizza, than actually go to work. But make no mistake about it. Tony is basically Paul Reiser, all the way down to the neurotic mannerisms and the bad jokes. Anyway, through the help of an old friend, Tony has gotten a job. He’s going to be working in a state-of-the-art tower, one that is totally run by a computer system known as CAS. CAS is designed to eliminate any and all security threats. For instance, when an unauthorized pigeon lands on the tower’s roof, it doesn’t take long for CAS to reduce that pigeon to a bunch of floating feathers. Tony has been told that it’s very important that 1) he have his security card with him at all times and 2) that he not damage his security card in any way. So, of course, Tony damages his security card. With the help of a security guard, Tony still manages to get inside the tower but, since his card doesn’t work, CAS considers Tony to be a security risk. When Tony proceeds to casually violate several security rules and stays in the building after hours, CAS decides to destroy him. Unfortunately, since Tony is kind of needy and always has to have people around him, everyone else in the building ends up getting killed too. The majority of the film deals with Tony crawling around the building, just like Bruce Willis in Die Hard. CAS is determined to kill both him and his potential love interest. We’re supposed to be angry at CAS and concerned about the world’s dependence on technology but you know what? THIS IS ALL TONY’S FAULT! Seriously, if Tony hadn’t damaged his card, none of this would have happened. Tony was specifically told not to damage his card but obviously, it didn’t occur to him that maybe he should try to follow the rules of his new workplace during his first day on the job! 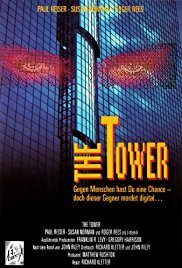 Anyway, The Tower is not exactly a good movie but it’s oddly watchable. Maybe it’s just because of how strange it is to see Paul Reiser doing the whole Die Hard thing. (Before anyone asks, The Tower was not meant to be a spoof. In fact, it takes itself pretty seriously.) Or maybe it’s just the fact that, by the end of the movie, you’ll totally be on the Tower’s side.